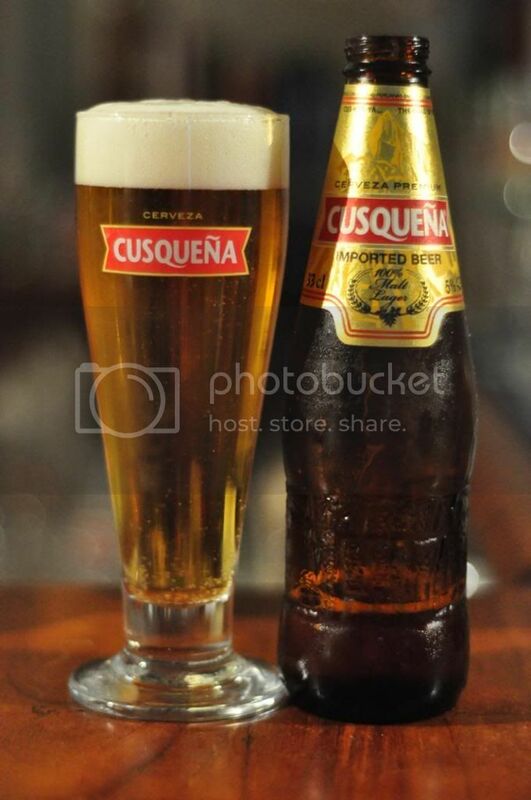 Cusqueña is a Peruvian all-malt lager brewed in accordance with the Reinheitsgebot. It's brewed in Cusco, near Machu Pichu, and incidentally it's name means "from Cusco". Cusqueña is the number one selling beer in Peru and a winner of multiple awards from all around the world. My former self had this to say a couple of years ago: "When I started this challenge I never thought I would take in a beer from Peru. But when I was recommended it I thought why not, and really that is what this beer is about. It's nothing fancy with complicated flavours, it's just a simple Malt Lager. I reckon it's worth a go if you see it, even if it's just so you can say you have had a beer from Peru." Peru's beer of choice pours as you wish every lager would; it's close to perfect! The body of the beer is a beautiful golden colour with plenty of tiny bubbles rising towards an off-white 2 finger head. The head has good retention with a layer of foam lasting throughout consumption. It's also worth noting the bottle has a very cool design of the Incan wall in Cusco. It'd be had for a lager to look better than this. Strangely enough for an all-malt lager, Cusqueña has plenty of malt on the nose. The overall feel of the nose is pretty sweet but there is some bitterness from the hops and some citrus characteristics as well. There's hints of corn, but it's good corn it's not disgusting skunked smelling corn. There's certainly better noses out there and this one may put a couple of people off. Flavour is important in South American beers and Cusqueña has that in bucketloads. It's very big on malt with hints of lightly sour lemon. The overall feel is of the beer is slightly sweet, but not unpleasantly so the citrus does just enough to balance it. It's very refreshing and has a similar mouthfeel to a European pilsner. It's a beer that would make an excellent thirst quencher. Cusqueña claim that because beer is over 90% and they use melted glacial water from above 18,000 feet, that they're beer is one of the best in the world. I'm not so sure about that but this is an excellent all-malt lager. It manages to satiate the South American need for flavour while also accommodating the more Western need for crispness. If you are a lager drinker it's certainly a beer to keep an eye out for.